When purchasing a sulcata tortoise for sale, be sure to do your research in constructing the best sulcata tortoise habitat. 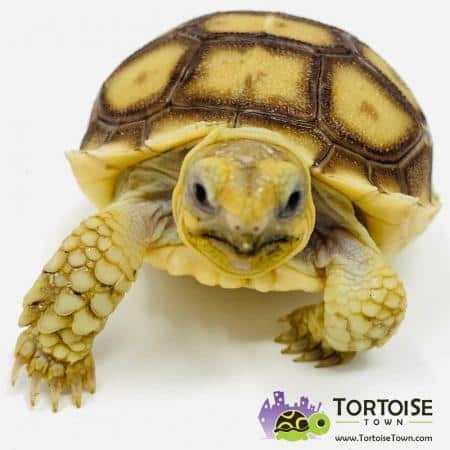 Before purchasing your new baby sulcata tortoise for sale, do your research and learn about proper African sulcata tortoise enclosure setup and build the perfect Sulcata tortoise habitat whether it be sulcata tortoise table, or an outdoor spur thigh tortoise enclosure. Because of their size, sulcata tortoises are best kept by those who have access to an outdoor area, where their tortoise(s) can be kept for most, or all, of the year. We keep our sulcatas in a desert-type setup outdoors with a large grass area in the center and dirt around the perimeter. They commonly “patrol” the perimeter of their enclosures, so we leave it dirt there, because any grass would just be destroyed with time. Sulcata tortoise enclosures require a sturdy wall at least 24-inches in height above ground, as well as 12- to 24-inches below ground to prevent (or discourage) these tortoises from digging. Concrete masonry blocks work well when cemented in place, as well as a well-built wood wall as a barrier. See-through fences and walls shouldn’t be used, as the tortoises tend to try to escape through or over these walls. Be sure to do proper sulcata tortoise care research when you are finished learning about tortoise habitat construction. Sulcata tortoises are burrowers if there isn’t a proper hide box accessible as a cool retreat during the summer months or a warm retreat during the winter. There are exceptions to every rule, though. When the tortoises make efforts to dig, these spots should be filled in with large flagstones, etc., to prevent future digging. A single tortoise can be allowed to burrow naturally, but with multiple tortoises in an enclosure, they can “stack up” in the burrows, and the deepest ones will be unable to exit. Sulcata tortoises are grazers and will eat any grasses and most plants in their enclosure. We plant any of the various clump grasses as well as desert-type mesquite and African sumac trees, which also make for nice cage décor. Fragile plants are likely to be destroyed by the tortoises once the animals have any size to them. Young sulcata tortoises can be raised indoors. While outdoor housing is preferred anytime the temperatures are in the acceptable range, many people raise their sulcatas indoors for the first few years of life. Probably the best enclosures to use are simple plastic sweaterboxes, or a “tortoise table,” which you can buy or make yourself. The container itself isn’t as big of a deal as the furnishings you put into it, including substrate, lighting, temperature gradients and cage furniture. In cold climates, a suitable enclosure can be built in the garage for large tortoises that need to spend a few months indoors during the winter. These enclosures should be heated enough to keep the tortoises comfortable during the indoor months. When considering purchasing any baby tortoise, especially a baby sulcata tortoise, it is important to understand their needs. Using the right setup will ensure your new baby Sulcata tortoise for sale will thrive in the correct environment.